Folks who follow their gun dogs in the country of upland bird hunting understand it is a bit different than most other types of hunting. In this world, the hunter isn't looking for the game. They are watching the dog. The hunt starts and stops with what our four-legged partners do; they tell us everything we need to know to be successful. "Just try to keep up," they must think. We weren't hunting the other day when we followed Hugo into the high country. Just climbing mountains so we can always climb mountains. Hugo knew we weren't hunting — no guns — but there is no on and off switch for prey drive in a hunting dog. He would find and point birds if there were any there. We were climbing up a slope at the base of a wide shale slide that rose sharply a few hundred feet above us on our left. Hugo had made a sweep far above us, testing the wind, then back and across the shale slide, his nose driving his fast pace. Even when not hunting, we still watch the dog. Watching a big running setter, his leg and tail "feathers" billowing in the wind of the high country, is reward enough for the effort to be there. So we watched as Hugo rocketed across the shale slide, his feet tough from experience, as if he were on a sidewalk. He didn't know and wouldn't have cared if he did that his propelling paws dislodged, in rapid succession, three large pieces of granite. "Look out!" Christine hollered from behind me, and a moment later I heard the clatter of the camera on rock as she dodged to escape the incoming rocks. They weren't big boulders, but the slab-sided pieces were in the 10- to 15-pound range. The thing with those shale pieces is they are a bit like footballs — they bounce on the ground and change direction. I watched as one bounded past a couple of feet away. "That was close," Christine said after dodging a rock and tearing her pants. "Those could have killed us." "That would be funny," I said. "Hugo kills us and then goes on point waiting for his dead partners to come see." "That would not be funny," she said. "Do you have a Band-Aid?" "It would be a little funny," I said, "and if a Band-Aid will fix it, you don't need a Band-Aid. Now come on, Hugo has gone over the ridge." 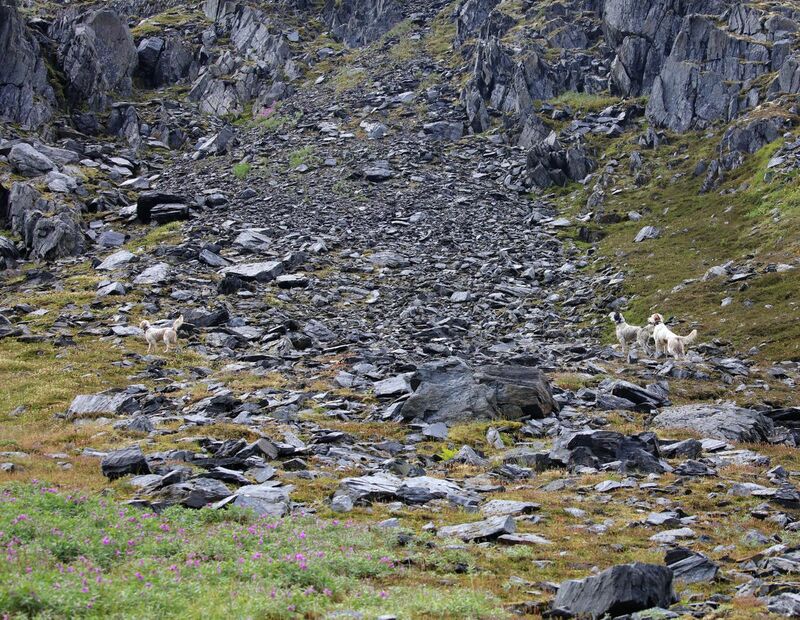 When Winchester was a young hunter, we were hunting for white-tail ptarmigan one October and he had crossed a steep ravine filled with residual avalanche snow. He went on point a few hundred yards beyond the far side of the snow slide. As I bailed off the steep bank, I heard Christine say she would wait on the high ground. All I could see of Winchester when I got to the bottom was his tail, and it was my focus as I started across the expanse. I was still focused on Winchester's tail about halfway across the 30 yards of snow when my feet went out from under me. The snow chute was steep, like what you would imagine a skier or snowboarder would consider a great find, and it was about 900 feet to the bottom. Holding the shotgun across my chest, I tried to dig my heels in, to no avail, as I gained speed. Coming up fast was a large rock in my path, and I thought if I could hit the rock with my feet and allow my legs to flex, I could take some of the impact with minimal damage. When hunting behind pointing dogs, the shotgun is not loaded until you are coming up beside the dog for the flush, a place I hadn't arrived at. A comforting thought, not knowing how this was going to end. My timing was perfect, but when I hit and flexed my legs, the impact drove the 28 gauge up into my face. I saw blood on the gun as I turned to look for Winchester's tail, which was out of sight. Starting the crawl to get to the other side and honor his point, I turned to look for Christine. There she was, standing up on the ridge, laughing. "That was awesome!" she hollered. "Winchester is waiting." Winchester and I met Christine at the base of the snow slide, after I took two ptarmigan from the point he held all the while I was sliding around in the snow. It was when we crossed the rushing melt-off stream that Christine she saw my face. "Oh my gosh, I'm so sorry, but it was so funny," she said with as much sympathy as I deserved. Subsequent to his attempt on our lives, Hugo was coursing another shale- and rock-strewn slope ahead of us when he slammed on the brakes, his tail high, the feathers backlit by the morning sun. "You see that?" Christine yelled from the 10 feet that separated us. Hugo is Christine's Winchester. They are as close to being soulmates as Winchester and I are. Going into his fourth season, he is the heir apparent to Winchester's throne, and watching Christine's delight in his success is priceless. "Let's go have a look," I said. As we approached, we could see ptarmigan chicks scurrying through the rocks as the hen barked orders for them to scatter. "Just like Winchester," Christine said, her voice quavering with pride as Hugo held his point like a statue. As I worked my way around the hen and chicks to Hugo, where I led him away from the birds, I thought that even if he dislodged a rock that killed me, Christine would kneel down, hug him and tell him, "Good boy." The upland season for Alaskans opens Friday, and having seen the size of the young birds, we'll be in the mountains, but we won't be shooting much unless the setters find adult singles. Regardless, we'll be watching the setters, and that alone is worth the price of admission — even if Hugo happens to stone one of us to death. 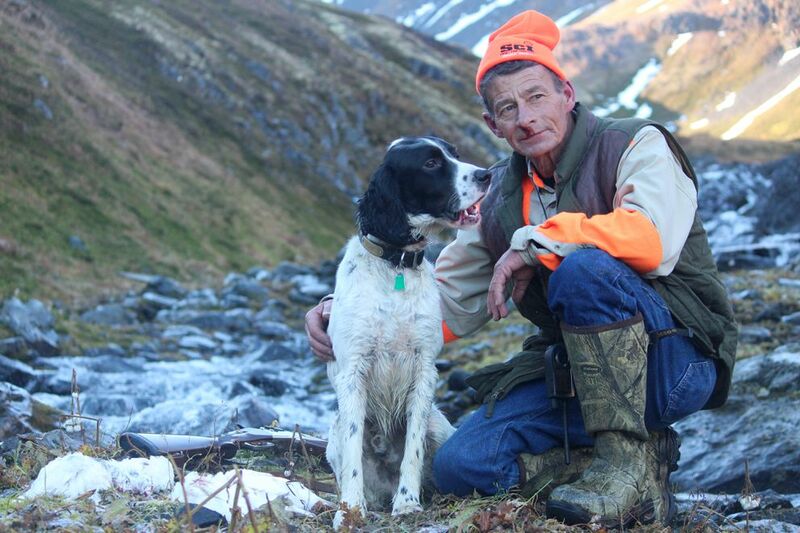 Steve Meyer of Soldotna is a lifelong Alaskan and an avid shooter. Contact him at oldduckhunter@outlook.com.